Never miss out on the amazing benefits of Essential Rewards with PV Assistant! Hit your desired PV level every month — even if items you regularly order are out of stock. With so many great monthly ER rewards every month and the ability to earn points back and income, keeping your PV where you want it matters! PV Assistant makes sure you always hit your monthly PV goals even if something in your regular ER order is out of stock! And since you get to tell it what to order, you’ll always get more of the Young Living items you need and love! 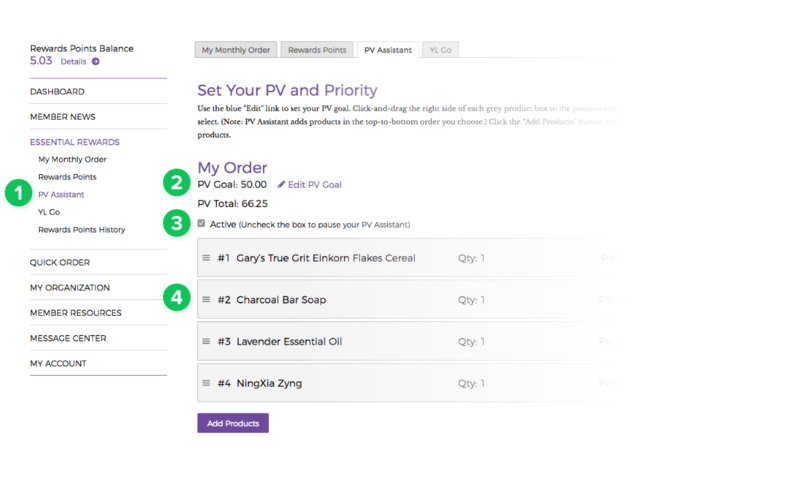 PV Assistant can be found under the Essential Rewards menu inside Virtual Office at YoungLiving.com. To qualify for Essential Rewards, you must maintain a 50PV order each month. To qualify for commissions, a 100PV order is required. You can edit your PV goal here. Make sure PV Assistant is set to Active to meet your PV goal each month. You can use rearrange the items on your list to control the order in which they’re selected. Get the most out of your ER Membership today! SETUP MY PV ASSISTANT NOW Or get more details at YoungLiving.com.